A suspicious fire combined with a blocked exit turned the women's ward of a Moscow drug treatment hospital into a deathtrap Saturday as flames and smoke overcame patients. At least 45 women trapped behind a locked gate were killed in the deadliest fire in the Russian capital in decades. Russia's chief fire inspector, Yuri Nenashev, said he was "90 percent certain" the fire was set deliberately, and Mayor Yuri Luzhkov said it appeared to be arson or extremely careless handling of flammable materials. The fire erupted in a wooden cabinet in a kitchen at one end of a corridor on the hospital's second floor -- a factor that led to suspicions of arson. The main emergency exit was blocked by a locked gate and the only other way out was cut off by choking smoke, Nenashev said. The barred windows were shut with locks that hospital personnel, who had the keys, apparently did not have time to open. The pre-dawn fire started in a kitchen located at the end of a corridor on the second floor when a wooden cabinet suddenly caught fire. The womans ward of the hospital, located on the second floor, quickly filled with smoke. All people in the ward were trapped, as the main emergency exit was barred by a locked gate, and the only other exit was rendered unusable by thick smoke. All the windows in the hospital were shut and locked. It is known that staff had the keys to open these windows, but it appears they did not have the time to do so. A call was made to the fire department at 1:30 AM, but by the time firefighters arrived, all 45 of the trapped women, including two hospital workers, were dead. A total of 160 people were evacuated from the building, ten of whom where hospitalized for carbon monoxide poisoning. Another person died two days later on December 11 from burns sustained in the fire. 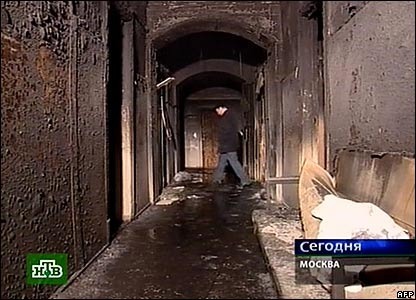 A fire at a Moscow drug rehabilitation clinic killed 45 people - all women - in what Russian authorities said was probably arson. Twelve persons were injured and taken to hospital. Two of the dead were nurses, the rest were patients. Fire department officials said the victims either suffocated or were killed by poisonous gases from the plastic coating on the walls. Emergency Ministry officials say a fire that broke out overnight in Moscow's drug rehabilitation hospital has killed up to 42 people. The ministry's spokeswoman, Irina Andrianova, was quoted by the ITAR-TASS news agency as saying a total of 214 people were rushed to safety out of the burning building. Conflicting reports also came as to the number of those rescued, with Emergency Ministry officials saying that "some 100 people were rescued and 50 were hospitalised, there is no threat to their lives, they are safe," as quoted by Interfax. Earlier firefighting officials said some 150 people were evacuated. 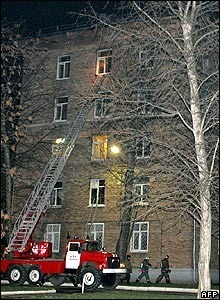 Flames began on the second floor of the eight-story building of Moscow's 17th city drug hospital at 1:40am (local time).